There is a lot we don’t know. 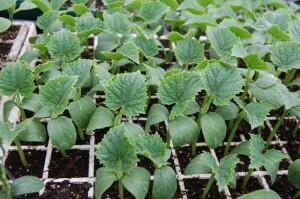 As our starts get bigger and planted out, we’re seeing how inexperienced we are in greenhouse and hoophouse management. Because we don’t have quite enough space on the farm for all of our plants, we’ve been renting a portion of a greenhouse about 15 minutes away. This greenhouse is run by a couple of our buddies, both far more knowledgeable and experienced than either of us. Five or six weeks ago there was an outbreak of aphids in the greenhouse. Our plants, and another space-renter’s, had the little buggers all over them. The infected plants were immediately removed, and that left us with a lot of aphid-ravaged plants and no where to put them. We set up a shelf in our hoophouse (a 10’X6′ space where salad mix and spinach were just shy of harvest) and shoved in all of our tomato, pepper, eggplant, and artichoke starts. When Kaly and Brian first told us that the bugs had invaded, I thought “Ok, no big deal. We’ll deal with it and in a week or two they’ll be gone.” When we planted the tomatoes that I thought hadn’t been too harshly affected, I found myself sorely mistaken. Half of the planting came from our bug-infected greenhouse and half we brought from the clean greenhouse at Brian and Kaly’s. The difference, in both size and vigor, was astonishing. It’s unfair to blame the difference entirely on the aphids, though they certainly deserve some credit. Our greenhouse gets much less light than Kaly and Brian’s. They also feed their starts with fish emulsion three times a week. All of those factors combined (aphids, lack of light, lack of fertilizer) put our starts a staggering step behind our friends’. Since then, we had been feeding our starts with diluted kelp concentrate once a week. It clearly helps, though the cucumbers and other cucurbits don’t seem too taken with the offering. We have always used fish emulsion to pump up starts for transplant into the outside soil, and finally last week added a bit of fish to the kelp each week to give them an extra boost. 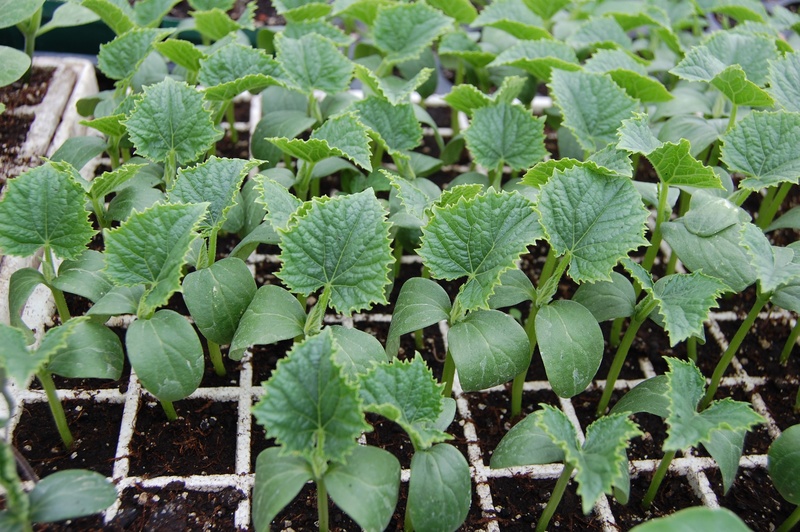 While the mixture can damage (burn) really young plants, the ones that have developed their true leaves will appreciate the extra nutrients. The difference in speed of growth has been enormous. Even with the grey rainy days that have recently plagued the valley, our starts are finally looking up to par. 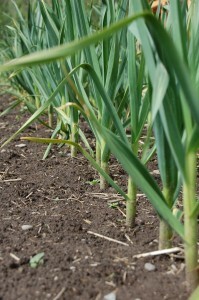 This month has seen us go from nothing in the fields (except garlic, which is looking extraordinary!) to about half of our beds planted. 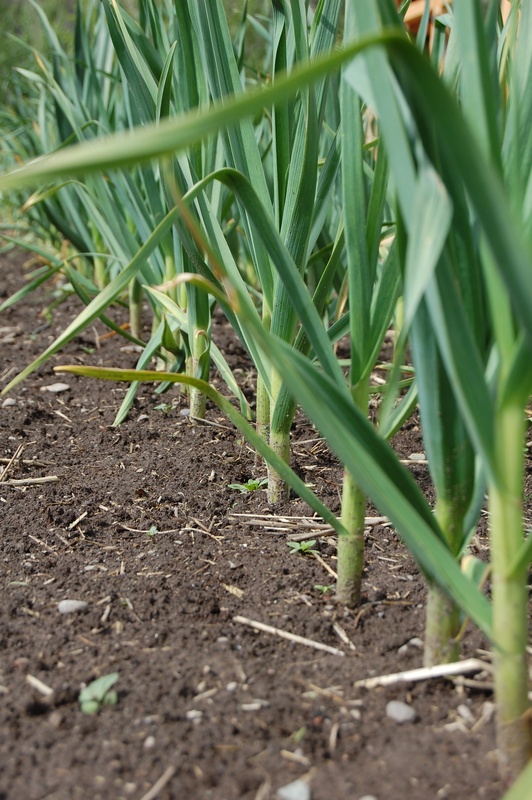 Onions and potatoes, squashes, greens, and almost all of our tomatoes, eggplant, peppers, and tomatillos are happily in the ground. 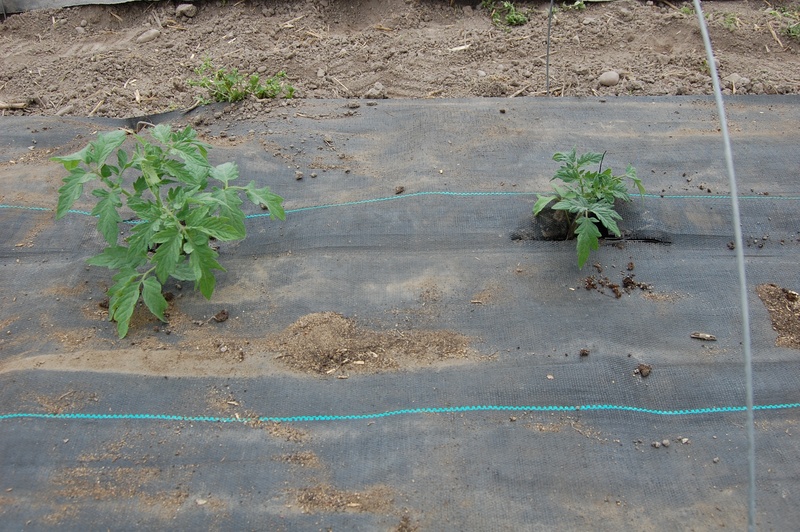 Margaret laid the drip line out under black landscape fabric which we’re reusing instead of buying black plastic, and we have finally taken down all of the hoops and row cover from the asparagus for use in the solanaceous field and the melons. Now that asparagus harvest is over, we have a lot to catch up on. Farming in Montana means taking advantage of every warm spell, every rain, and every locational edge. We’ve been told that this farm is in the “banana belt” of western Montana, and because of it we can successfully grow melons, tomatoes, peppers, cucumbers, and other long- and hot-season crops. 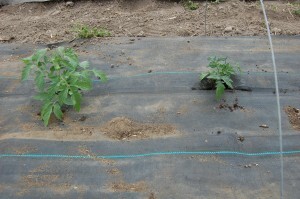 Our melons, tomatoes, peppers, and cucumbers, however, are still two weeks behind the curve. Not knowing how to time our seeding, we started a little late and with too little light in March. While our farm friends planted four thousand peppers three weeks ago, we had to wait until ours could withstand the traumatic transplant and the unpredictable great outdoors. When we tell people where we’re farming they say “Oh yeah, that’s such a great spot—you must be about two weeks ahead of the rest of the valley.” While our weather is, indeed, about two weeks ahead of the rest, we’re lucky to be keeping up with the pack. « previous article: USDA Conservation Programs: Are They Working for New Farmers?